How would you like to follow Anthony Bourdain to the places he has visited on his new show The Layover? 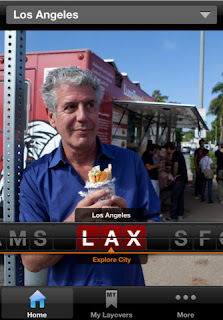 You can now purchase The Travel Channel Layover Guide by Anthony Bourdain. It’s available for iPhone & iPad and costs $1.99 on iTunes. With the app you can explore his favorite places to eat, drink and stay in 10 cities. More cities should be added later in the year. Cities covered so far: New York, Miami, Los Angeles, San Francisco, Montreal, Singapore, Hong Kong, Rome and Amsterdam.